Just in Time for Halloween: A Haunting Tale of Witches, Broomsticks, Black Cats, Owls, Bats, and Mayhem! This week, as I explored another of Sarah Eva Howe Salyers's scrapbooks, I came across a lengthy poem written in pencil on legal-sized, lined paper now yellowed with age. At the top was a title: "The Broomstick Train; or The Return of the Witches." Ah!, I thought. Sarah had written a poem that would be perfect to post close to Halloween! The longer I read, the more I wondered: Sarah wrote many fanciful, delightful poems, but did she write this one? An online search quickly revealed that the poem was written by Oliver Wendell Holmes (father of the more-famous Supreme Court justice of the same name) circa 1890 and published with illustrations in 1892. 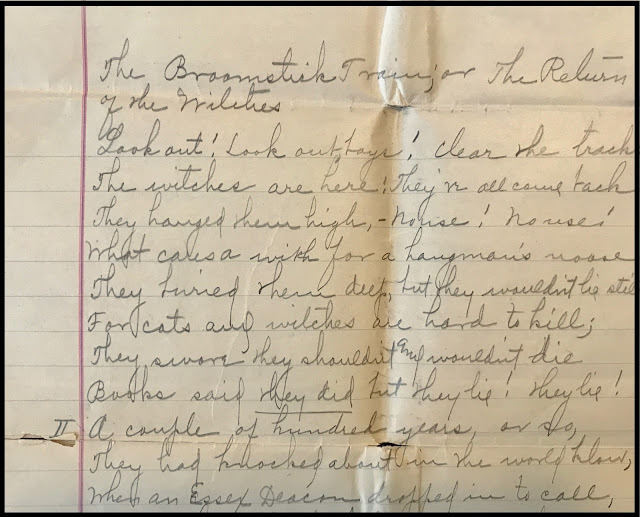 Here, in handwriting typical of Sarah's when she was in school (circa 1895), is the entire poem, with all of its quirky punctuation and phrasing. The illustrations by Howard Pyle (1853-1911) are from the 1892 edition, now in public domain. More illustrations, plus footnotes explaining many of the poem's references and providing historical context, are beautifully posted online. Out of curiosity, I researched a few of the lines and terms myself. I posted my findings as footnotes below. Note that "train" refers to an electric trolley car that runs on tracks. The witches are here! They’ve all come back. They hanged them high, —No Use! No use! What cares a witch for a hangman’s noose? They swore they should n’t and would n’t die. Books said they did but they lie! they lie! With one scant scalp-lock to shade its brow;). Do n’t bid me tell it, — my speech would fail. Come give us a taste of the upper air! “Where are our broomsticks?” the beldams cried. “Here are your broomsticks,” an imp replied. “And where is my cat?” a vixen squalled. As fast as they called the cats, they came. Ah, did n’t they curl their tails and purr! Than out they swarmed for a midnight spree. And they found dead crabs in their lobster pots. ‘Mid the peaceful dwellers at Beverly Farms. At your games of old, without asking me! The witches, the broomsticks, cats, and all. And here are the cars you’ve got to run. 1Herman's Woe – a reference to "The Wreck of the Hesperus," a narrative poem by American poet Henry Wadsworth Longfellow, first published in 1842. The poem presents the tragic consequences of a sea captain's pride and ends with a prayer that all be spared such a fate "on the reef of Norman's Woe." See https://www.poetryfoundation.org/poems/44654/the-wreck-of-the-hesperus. 4Beldam is an old term (1500s) for a malicious, shrewd, ugly woman, especially an old one; archaic term for grandmother; also a witch. 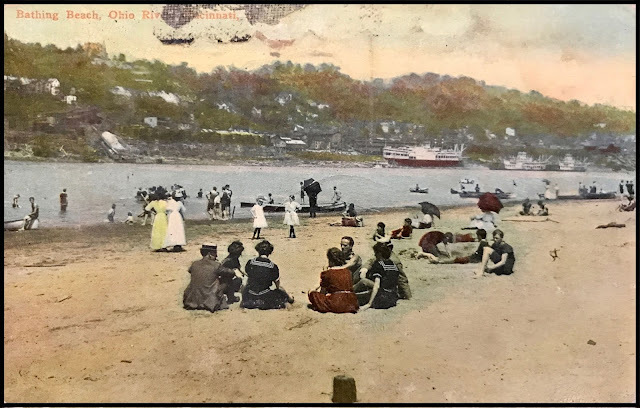 If email, Facebook, and Twitter had been around in the early 1900s, we would have no insight into communication among members of the Howe and Salyers families of Carrollton, Kentucky. 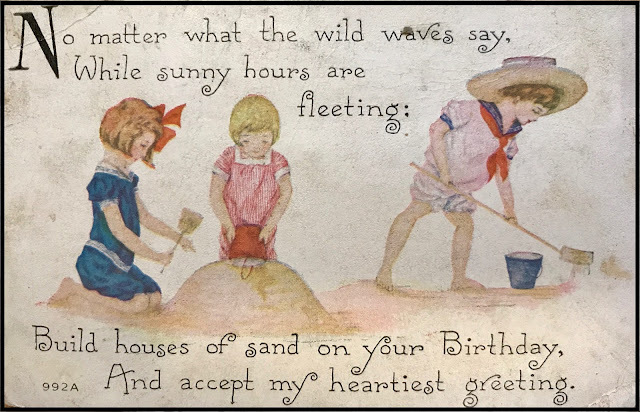 Thank goodness people actually wrote notes and cards to each other – and thank goodness Sarah Eva Howe Salyers pasted so many of those notes and cards into her scrapbooks. 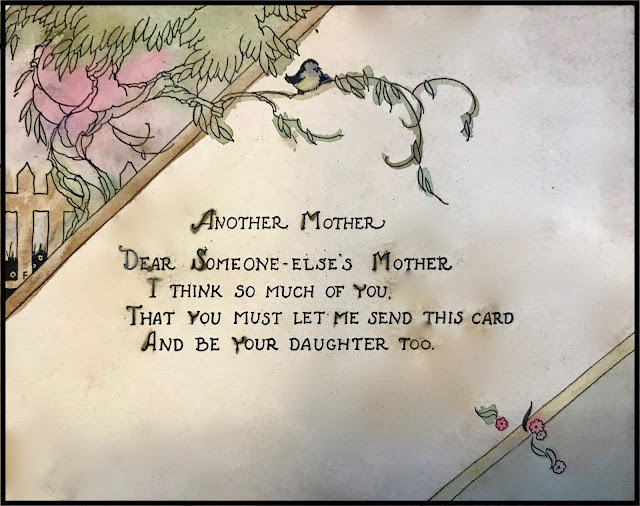 The most recent scrapbook I've explored contains many cards, and each one tells us something not only about Sarah but about the time in which she was a young woman. 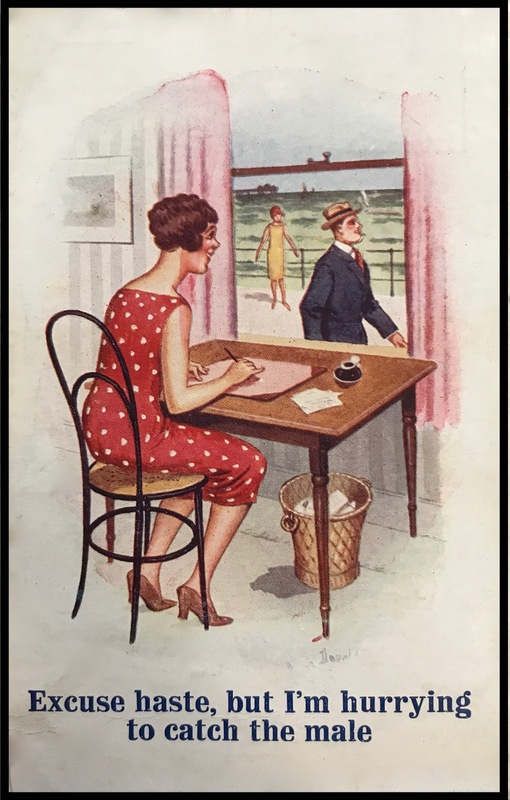 Today we'll look at some of those cards from the 1920s and 1930s. Some cards in the scrapbook celebrate birthdays, while others are for staying in touch. Here are examples of both kinds. These two birthday cards are pasted to old, crumbling pages, and I dare not try to remove them to see who sent them and who received them. This birthday card was probably addressed to one of Sarah's children. This sweet card invites someone to visit. 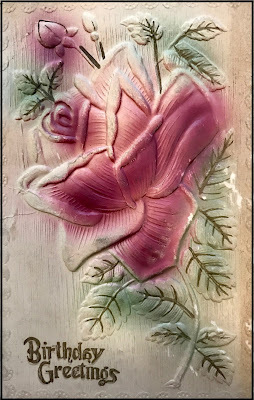 Someone is nudging the recipient of this card to write back. 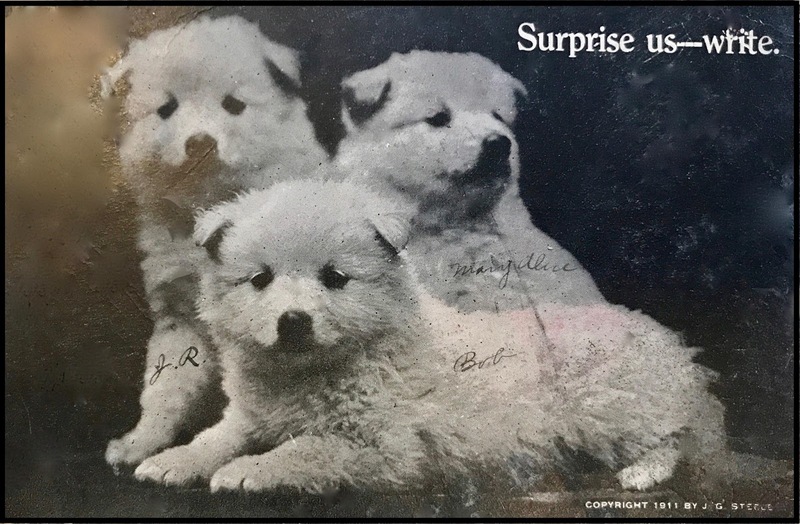 The sender, or maybe Sarah herself, tagged the dogs with the names of Sarah's children: James Richard, Bob, and Mary Alice. 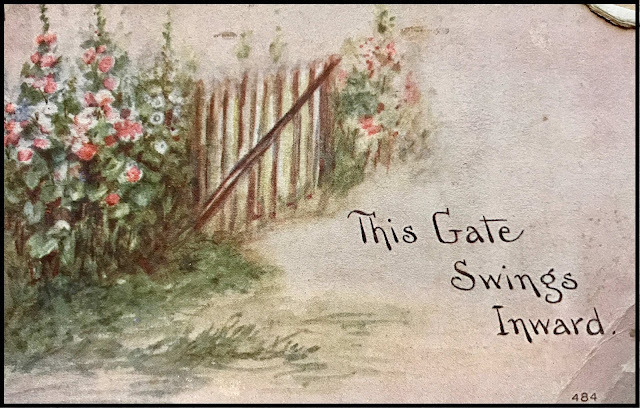 Sarah's sister Leonora Alice Howe sent this postcard from Cincinnati to her brother-in-law (Sarah's husband), William Levi Salyers, while he was traveling on business. "Who looks for your buttons now?" Sarah kept many cards that have a Dutch theme. Most of them, like this one, are stereotypical – a child wearing wooden shoes, a windmill, and messages written in ethnic vernacular to simulate mispronunciation of American speech. I know from her descendants that she often used this phrase about the weather: "There's just enough blue in the sky today to make a Dutchman a pair of britches." 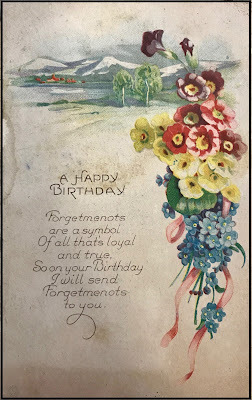 I'll post more Dutch-themed cards in future posts, maybe with some insight about American attitudes about Dutch immigrants in the early 1900s. I wish I knew the story behind this card. Who sent it? Who received it? 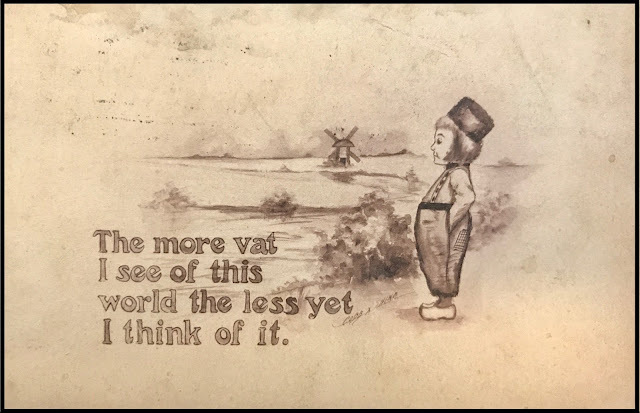 Last but not least, this card sent by Sarah's son James Richard ("Jim") to his sister Mary Alice, suggesting that it might apply to her. It was in the early 1930s, and letters in the scrapbook reveal that Mary Alice had caught the eye of a young man named Lawrence. Jim suggested that she would jump up and run after him if he walked down her street. Postcards and note cards tell a lot of stories. We'll look at more of them in a future post. In the meantime, I'll take a break from blogging to spend time with visiting relatives – three generations descended from Sarah's daughter Mary Alice.